The rights I’ve posted below are extremely important to me, because up until two years ago I didn’t believe I had many of them. To this day I am grateful for two things. 1. That my dad was just outside my room where I couldn’t see him; and, 2. That there was a bed between my mom and I. Because she lunged towards me. I’m fairly certain she was angry enough to actually do some real damage, had Dad not stepped in and grabbed her back. I vaguely remember them saying something along the lines of not talking back to mom, my cassette tape being thrown away, and them leaving to go shopping in the city for the day. When they came back later, Dad came into my room and gave me the tape back. I also remember some sort of admonishment to not speak back to Mom and that was that. I learned several lessons from that, and they pretty much shaped my relationship with my parents, and my life. First, you are not allowed to express your true feelings…even when asked. Second, when you’re asked a question, be sure you tell them what they want to hear. Third, you keep your “bad” emotions stuffed, because no one really wants to hear them or deal with them. Of course, that kind of relationship blew up in all of our faces a couple of years ago, when I was 35. 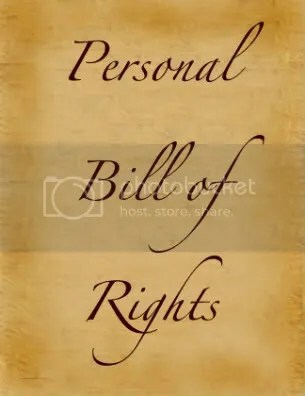 Through that learning experience I found a book “Healing from Family Rifts“ by Mark Sichel that had the Personal Bill of Rights in it. Sadly, most of those rights were a revelation to me. However, I’ve learned to exercise them and I’m doing better at that. Brad has been extremely helpful, in that he understands how I “work” and why I react the way I do at times. He gently reminds me that I get to feel how I feel and encourages me to remember my “rights”. These have also changed me as a parent, and I believe my kids are really benefiting from that. Particularly Megan, who now knows she may tell me if she’s angry with me, or thinks I’m being unfair, etc. She knows we’ll have a discussion about it, and if I’m wrong I will tell her so and apologize. I thank God for being made aware of these, as it is simply having respect for people as human beings. Maybe by posting these someone else will be able to find them helpful. You are more than just likable. You are downright lovable, in so many more ways than I could hope to touch on with drowsiness upon me. This very powerful piece evoked so many memories for me… I am grateful for the new awareness of my own rights that it gives me.